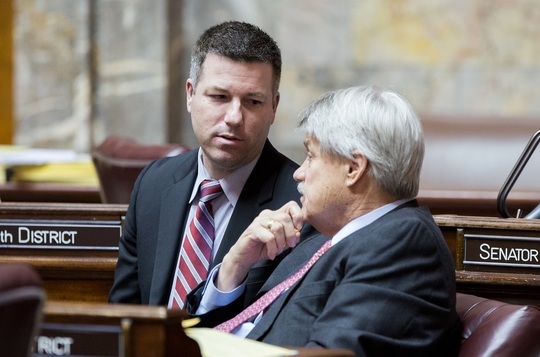 Sen. Tim Sheldon, a Democrat from the Puget Sound area, is a member of our bipartisan majority coalition. He is Senate president pro tempore -- meaning he presides over the Senate when the lieutenant governor is not available. The Senate has approved a second budget – the capital budget that pays for public projects around the state, including state parks and lands, state-owned buildings, and other construction-related activities. I expect the transportation budget will come before us for a vote this week. It is the third of the three budgets that must be agreed upon between the Senate and House before we adjourn for the year. When people speak of “the state budget” they typically mean the operating budget that pays for the day-to-day costs of vital services and programs, from public schools to managing natural resources to supporting our state’s most vulnerable residents. But the capital and transportation budgets are no less important to communities around our legislative district and the state because of the investments they represent. These two budgets were the focus of my interview this week with KOHO radio. Click here to listen to it. Last week the legislative policy committees wrapped up their work, and today is the deadline for budget committees to do the same. Then we will return to the Senate chamber fulltime, over the next week, to consider House bills that were moved forward by our committees. The House will do the same with Senate bills approved by its committees. Just one more deadline lies between now and the April 23 end of our regular 105-day session. The Senate capital budget would invest a record $1.1 billion in matching grants for school buildings and $700 million for higher-education facilities. That’s great for school districts and students but it results in fewer capital-budget dollars available for other public projects. Despite that, two projects I requested received an appropriation in the Senate budget, including $1 million for a Chelan County Emergency Operations Center and $1 million to address a buildup of minerals (primarily manganese) in the Brewster water system. I am also thankful that the Senate capital budget funds the state’s Centennial Clean Water Grant Program at a level sufficient to include much-needed upgrades to the Peshastin Wastewater Treatment Plant. The state grant would cover $2.1 million and the remainder, approximately $1.4 million, would be funded by the Chelan PUD. Please click here for more information about the Senate capital budget. The Legislature’s priority list for this year includes new budgets, a constitutional answer to the education-funding question and a remedy for the state Supreme Court’s Hirst ruling from October 2016. As I reported in an earlier e-newsletter, the Hirst case involves “exempt” wells, which withdraw less than 5,000 gallons per day for residential purposes. Such wells often serve as the water supply for residential development in rural areas. It used to be that counties could, when deciding whether to approve a building permit, rely on data from the state Department of Ecology about the availability of year-round water. In the Hirst decision, the court ruled that counties themselves must ensure adequate water supplies are available before issuing permits that would rely on an exempt well. This means additional studies, on the county’s end or the landowner’s end, and therefore more cost – tens of thousands of dollars more, potentially. That discourages people from buying land and property owners from building or selling, and means less activity for local lenders and the real-estate and construction sectors. The economic damage has already begun, especially in rural Washington. The Senate adopted Senate Bill 5239 in response to the Hirst case, in late February. I know this bill well, because in late January I chaired the meeting of the Senate Agriculture, Water, Trade and Economic Development Committee that featured a public hearing on it and another Hirst-related proposal. Unfortunately, the House committee that handles water issues has taken no action on the Senate bill. Also, the House didn’t approve a remedy of its own. However, our Senate majority is determined to have an answer for the Hirst case before we adjourn for the year.